McSweeney, P.L.H. and P.F. Fox (eds) (2013). 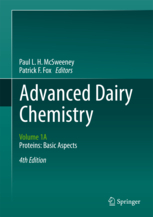 Advanced Dairy Chemistry-1A. Proteins: Basic Aspects, 4th. Edition, Springer Publishers, New York.